VRC-Pro is a virtual RC racing simulator that allows you to sit in the comfort of your home, shielded from the cold Canadian winter, and race against your fellow RC friends. During the off-season, September to May, RC Racers of Edmonton run monthly off-road races in 4WD SCT, Electric Buggy, Nitro Buggy, and Rally X.
VRC-Pro is a great way of easing the itch to race while waiting for the spring to arrive, and it can also improve your racing skills at the real track. To participate in our races you will need to download the software from the VRC website, or, if you are a Steam member, then you can get it through the Steam store. 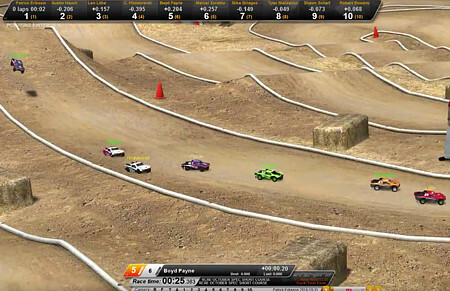 VRC-Pro offers anything from a free version with limited choices in cars and tracks, to different levels of subscriptions and add-on's depending on your needs. For best experience it is recommended that you use your real transmitter/receiver in combination with the VRC-Pro USB adapter. You can get the adapter from one of our sponsors or from the VRC E-shop. You can find RCRE's VRC club by clicking here, and you can also inquire about VRC-Pro on our facebook page.